The next few elections will determine if the US remains a minority-ruled country for the foreseeable future. And is there a significant number of non-voters who are predisposed to vote for Democrats. 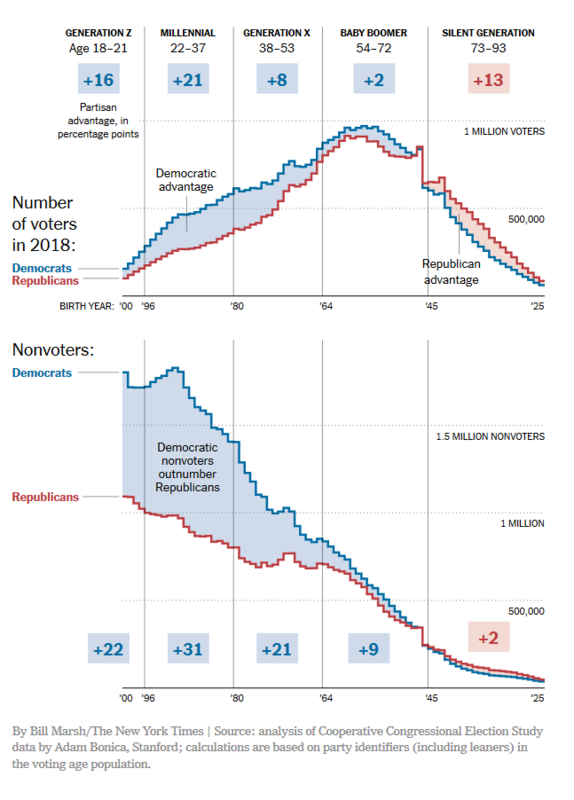 The bottom chart shows that, while the nation is on the cusp of a generational revolution, Millennials and Gen Z’ers haven’t turned out to vote in the way that their elders do. This negates a 31 point Democrat edge in Millennials. Bonica says that as they age, Millennials will become more likely to vote. He cites a general rule of thumb that turnout increases by about one percentage point with each year of age. This makes it possible to forecast how the generational advantage will grow over the next decade: By 2026, Millennials are expected to account for 19% of votes cast, up from 12% in 2014, with Democratic-leaning Gen Xers and Gen Zers accounting for an additional 34%. As this happens, the Republican-leaning Silent Generation is projected to account for only 8% percent of votes cast in 2026, down from 23% in 2014. Their participation is bound to go down, the oldest members of the Silents will be 101 in 2026. This makes democracy an issue to campaign on. The Democratic base understands that it is waging a battle for the future of the country….They are also painfully aware that our electoral system is biased against them. A rallying cry to put democracy back on the offensive will get the base to sit up and pay attention. Delivering on the promise will get them to the polls. This year, the Democrats need to focus with laser-like attention on winning the House. They are unlikely to get the Senate. Possibly, they can limit their losses to few, or maybe zero, net. The Democrats can point at the GOP, saying they are the party of corruption, and of doing the bidding of the rich elites. From the Democrats’ point of view, ensuring democratic elections means: Less hacking, easier registration, more days of early voting, and vote-by-mail. All encourage civic engagement and participation. 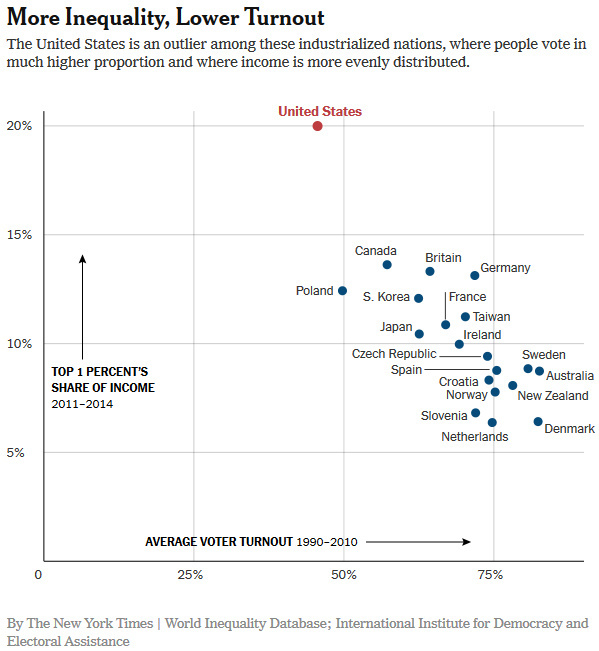 The fact that Republicans generally do worse when more people turn out to vote is their own fault. We need to point out that their plan is to use vote suppression to weaken democracy, replacing it with a Trump-branded authoritarianism. And there’s the issue of the Republican-controlled Supreme Court. It will have a strong conservative majority for the next few decades, and that’s going to mean Citizens United isn’t going away, and the Voting Rights Act won’t be strengthened. Our only weapon is turnout. We can’t just sit back and let demographics deliver us to power. Democrats will have to fight for these policies. We shouldn’t care that the odds seem stacked against the people who back these values. Generational change is coming, and with it an opportunity to fundamentally transform the American government and who it serves. To help with that, Democrats must insist on making voting easier, and more universal. Then, do everything in our power to make it happen.